Giving and receiving feedback effectively is a key part of the UGME curriculum. It’s also key in nearly every workplace, which could explain why there are so many different frameworks and recommendations for feedback “best practices”. Some of these are more effective than others. Have you heard of the feedback sandwich? It’s one of the more popular feedback techniques and involves “sandwiching” negative or constructive feedback with two pieces of positive or complementary feedback. It’s also sometimes known as “PIP” for “praise, improve, praise”. The idea behind this is laudable – cushion the blow of negative feedback and reassure the individual that they are doing some things well. I’ve just received two pieces of praise and one of criticism or a suggestion for improvement: what should I focus on? The negative feedback is about something I did today, the positive things were from last week – the positive stuff must not be as important. Two pieces of praise and one of criticism – guess that I’m mostly doing well! The last thing they said was praise – must be doing great! Thinking it’s easier for people to hear and accept negative feedback when it comes with positive feedback. Believing giving positive feedback with negative feedback reduces discomfort and anxiety. 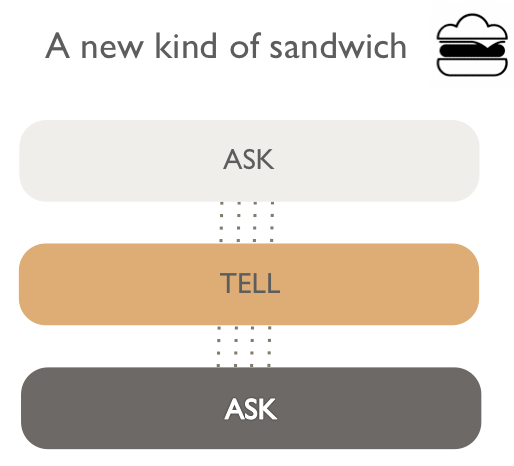 Easier: Most people on the receiving end would prefer to skip the sandwich – get to the point. Reducing anxiety: “The longer you talk without giving the negative feedback, the more uncomfortable you’re likely to become as you anticipate giving the negative news.” Meanwhile, the person on the receiving end “will sense your discomfort and become more anxious. Process or Content (knowledge or the way they use the knowledge; application of knowledge). Background knowledge (this is knowledge of the discipline, scientific foundations, knowledge base). The ATA model helps preceptors focus the discussion while scaffolding self-regulation and self-assessment. It also avoids the mixed-messages of the feedback sandwich approach. The ask-tell-ask oral feedback is best paired with written narrative feedback. Watch for a blog post on this topic in September. We used PowerPoint slides from a presentation prepared by Sheila Pinchin and Eleni Katsoulas, with slides from Cherie Jones, to prepare this blog. We thank Sheila and Cherie for their contributions. Amongst the plethora of student feedback we solicit about our courses, you may wonder why we sometimes add in focus groups. What could be added to the more than a dozen questions on course evaluation and faculty feedback surveys? The information we gather in student focus groups doesn’t replace the very valuable narrative feedback from course evaluations, rather, it allows us to ask targeted questions, clarify responses and drill down into the data. Merton used focused interviews to gain insight into groups’ responses to text, radio programs and films. Politicians and marketing companies soon seized upon focus groups to gauge voter and consumer trends. The Queen’s UGME Education Team uses focus groups in a targeted way to augment information gleaned from course evaluation feedback, course director’s meetings with academic reps and other feedback tools. 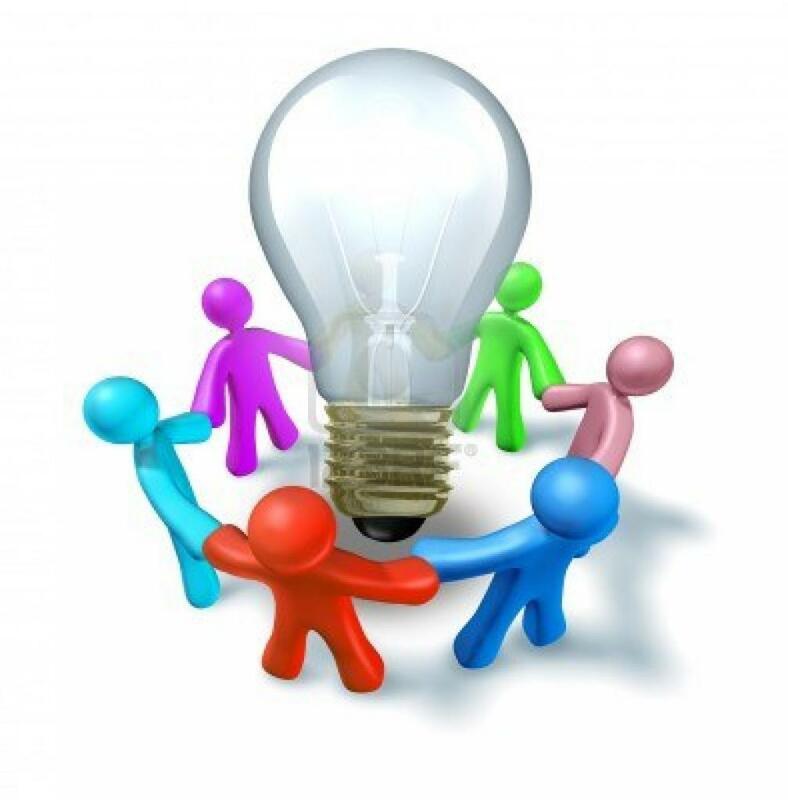 According to a briefing paper from Carnegie Mellon University, focus groups are “particularly effective” for eliciting suggestions for improvement. “They are also much more flexible than surveys or scales because they allow for question clarification and follow-up questions to probe vague or unexpected responses.” It also helps that faculty rate focus groups as “accurate, useful and believable”. If you’re asked to participate in a focus group, only agree if you think you have something to contribute to the investigator’s project or purpose. (Sure, it’s fun to come for the free food, but be prepared to contribute in a meaningful way). To be informed if the focus group is for research or curricular innovation (or both). Research studies must have approval from the Research Ethics Board and require specific paperwork to document informed consent. 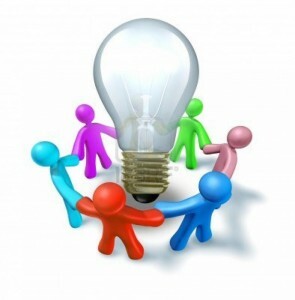 Curricular innovation focus groups are less formal, but will still respect confidentiality of participants. These might not have the same paperwork. The facilitator to set the ground rules, and guide the discussion. Savvy facilitators will do this with a minimum of fuss: they will listen more than they speak. (But you can certainly ask for clarification if you’re not sure of a question). A co-facilitator will likely take notes and monitor any recording equipment used. The co-facilitator may summarize after each question and solicit further input as required. You’ll be asked specific questions, and engage in conversation with the other participants. A venting session. This isn’t the time to just complain. 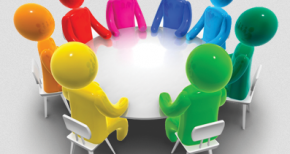 A focus group is looking for constructive feedback and suggested solutions. To always have your say: the facilitator may realize they have reached saturation on a particular question and will move on. This is to respect your time. (You’ll have an opportunity to send additional comments electronically afterwards if you felt there is an important point that was missed). If the questions are provided in advance (this is best practice but not always possible on tight timelines!) you should take some time to think about them. Be sure you know where the meeting room is, and arrive on time. Contribute, but make sure you don’t end up dominating the conversation. The facilitator will be looking for a balance of views and contributors. Listen attentively to others and avoid interrupting. The facilitator will make sure everyone has a chance to contribute – you’ll get your turn. It will be confidential. Different strategies are employed. For example, you may be assigned a number during the focus group and participants asked to refer to people by number (“Participant 2 said…”). In a formal research study, you should be offered an opportunity to review the data transcript after it is prepared. (This is sometimes waived on the consent form, so read carefully so you can have realistic expectations of the investigator). The end product is a summary of the conversation, with any emergent themes identified to answer the research questions. A magic bullet solution to a challenge in a course or class. One hundred percent consensus from all participants – you can agree to disagree. For all outlier opinions to be represented in the final report. These may be omitted from summary reports. We’re always grateful to our students for donating their time to our various focus group requests throughout the year. These contributions are invaluable. If you think this type of data collection could be useful in your course review and revisions, feel free to get in touch. It’s one of the tools in our qualitative research toolbox and we’re happy to deploy it for you as may be appropriate. What started as a project for her Critical Enquiry class turned into an award-winning poster presentation for Kirsten Nesset of MEDS 2017. 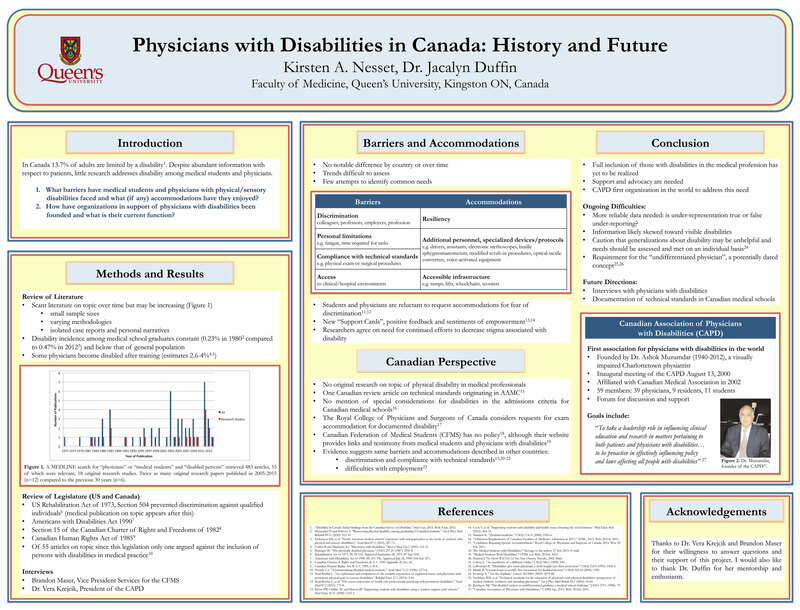 Nesset attended the 24th annual History of Medicine Days Conference at the University of Calgary in March where she won Best Poster Presentation for “Physicians with Disabilities in Canada: History and Future”. 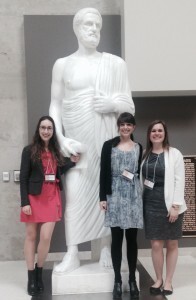 Elena Barbir, Sophie Palmer and Kirsten Nesset with the statue of Hippocrates at the University of Calgary during the History of Medicine Days Conference. 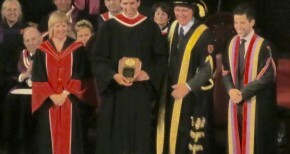 This is a traditional picture taken by Queen’s students who attend the conference. 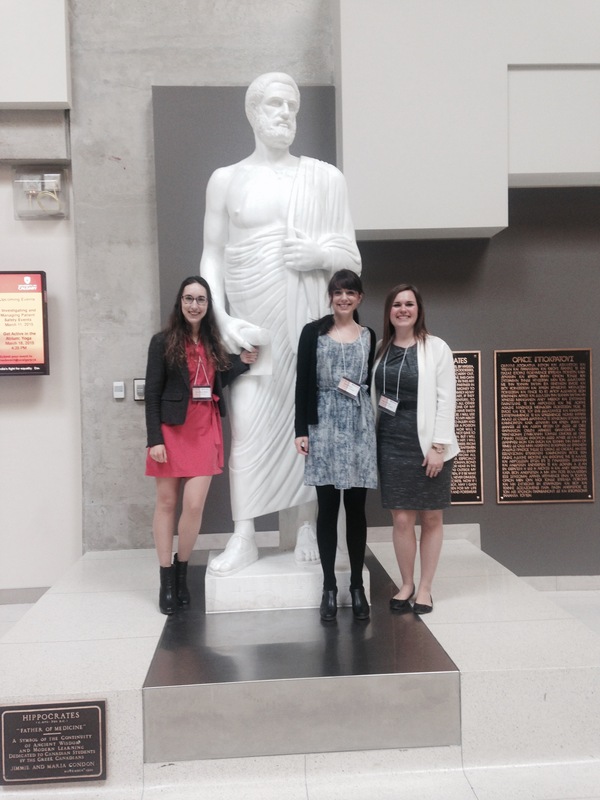 Classmates Elena Barbir and Sophie Palmer also attended the conference, presenting on their Community-Based Projects. 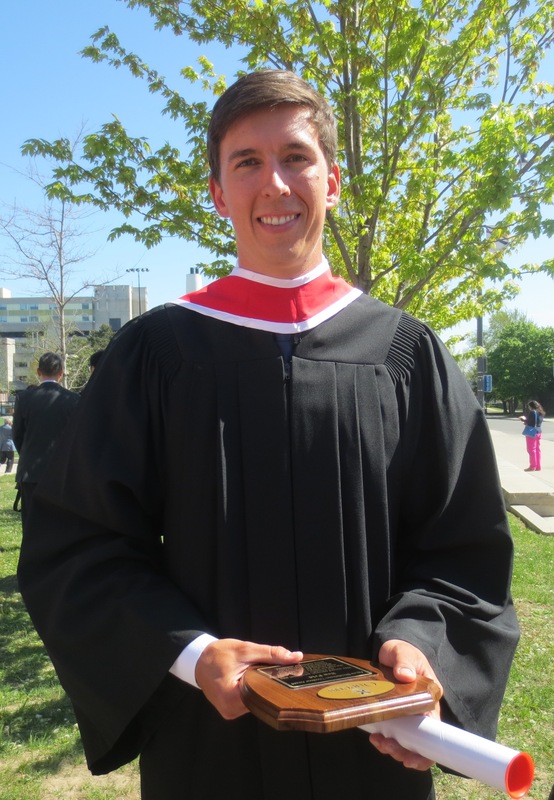 The three received the Boyd Upper Prize, which is awarded to the Queen’s medical student or students who have conducted original historical research and then had the work accepted for presentation at a peer-reviewed meeting. Nesset’s interest in the area of disability started at home, she explained in an interview. “It was something I was really interested in because my father has a visual disability and he’s an engineer,” she said. “He lost his vision when I was about 10 – so I grew up with him adapting to that and his work making accommodations.” And this got her thinking. She quickly discovered that there wasn’t much information readily available. “It ended up being a much more global project in the end because there’s very little research in Canada,” she said. Nesset’s award-winning poster. Click on this image to enlarge it. 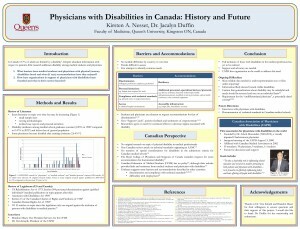 “Although Kirsten’s focus was Canada, she discovered that a relative silence on physicians with disabilities pervades the literature in general, making her findings relevant well beyond our borders,” Duffin said. She would also like to delve further into what medical schools list as technical requirements for graduates. “Part of my project was looking into admissions requirements and there’s nothing in those but there’s a lot of talk about meeting technical standards and technical requirements and each school approaches that differently,” she said. As she is starting her clerkship rotations in the fall, Nesset is hoping to complete some interviews by the end of the summer, but sees this as a longer-term project. 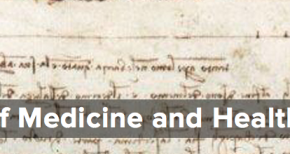 “A history of medicine project doesn’t necessarily mean you’re looking far back in the past, it can be more recent and you can apply it to future considerations, for example for policy development,” she said. We’d like to feature news about our students’ achievements at conferences such as this. If you have a suggestion for a student to feature in a future blog post, please email me at theresa.suart@queensu.ca. We’ll follow-up on as many as we can. Whether it’s the dreaded Service Ontario snap-shot that haunts us on our driver’s licence, or the passport photo that looks like we’ve been through a car wash, many of us despise the photo requirements public life tosses at us. To these government-issued ID requirements, add the MEdTech Profile picture request. Please. 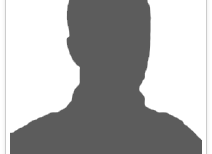 Because we really need everyone to upload pictures to their profiles. Why bother? 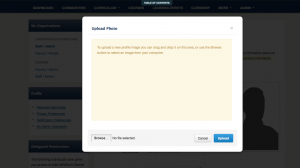 There are two key reasons we need these photos: for proper faculty and preceptor identification during course evaluations; and to avoid email directory confusion. Every faculty member who teaches four or more hours is evaluated by our students as part of our ongoing course and faculty review processes. This ensures appropriate feedback and contributes to overall quality of educational experiences as well as meets accreditation standards. Additionally, evaluation of clerkship preceptors is expanding to include multiple short-term supervisors. The challenge for our students is that by the end of a semester or rotation, they have dozens of faculty members they have had limited contact with and they’re faced with a list of names and forms to complete. 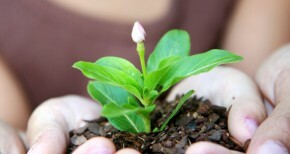 Marketing researchers have long valued the power of images. According to experts at 3M and Zabisco, 90 percent of information transmitted to the brain is visual, and the brain processes visuals thousands of times faster than text. Also, 65 percent of people are visual learners. For visual learners, that picture memory-jogger is essential: What we’ve heard from students is, by the end of the semester, with so many different instructors, they’re really not sure who they’re evaluating and they’d like to provide appropriate feedback. 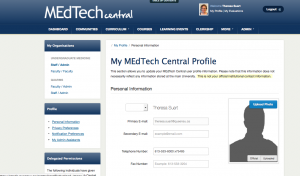 If there’s a picture affiliated with your MEdTech profile, this helps sort out who’s who. With a last name like “Suart”, I rarely run into email directory confusion, it’s more misspellings I worry about. However, if we also had a Theresa Stuart in UGME as either a student, staff or faculty member, you can bet there’d be some confusion. Or ask Matt Simpson – but which one? Matt Simpson, Manager of the Education Technology Unit, or Dr. Matt Simpson, Department of Family Medicine? (By the way, welcome to UGME, Dr. Simpson!). Again, photo identifiers can help resolve these types of issues. Remember that MEdTech is a password-protected learning management system and is only accessible by our students, staff and affiliated faculty. 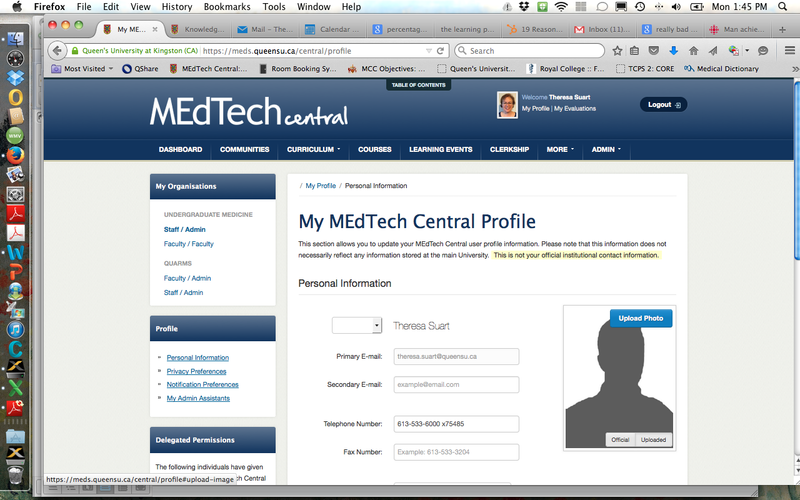 Adding your photo to your MEdTech profile is an easy two-step process: Get a picture and Upload it to MEdTEch. A well-cropped selfie from your iPhone, a snap-shot by a family member, or call me, and I’ll come to your office and take one. 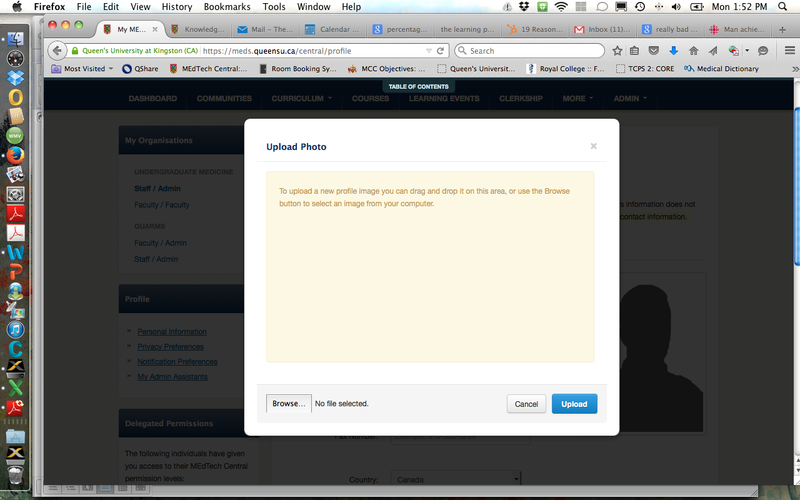 Thanks to all faculty and staff who have already uploaded their photos. Questions or concerns, please feel free to email me at theresa.suart@queensu.ca — or find me in the MEdTech directory. 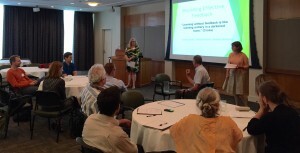 June Curricular Leaders Retreat held: EPAs, Remediation and Feedback, oh my! After bringing another busy semester to a close, UGME curricular leaders took time to reflect on the past year and take part in workshops and discussion groups on a number of areas of the curriculum at their semi-annual Curricular Leaders Retreat on June 19. The aim of the retreat was to share information and to generate ideas and solutions to address teaching and assessment challenges. In his end of year report, Associate Dean Anthony Sanfilippo highlighted accomplishments of the past year as well as announced new faculty appointments. After providing an entertaining and informative review of the process of curriculum renewal that UGME has undergone over the last several years, including the development of the “Red Book” objectives, Dr. Sanfilippo discussed how the emerging use of Entrustable Professional Activities (EPAs) will relate to and refine our existing curriculum and assessment processes. Dr. Sue Moffatt presented an information session on how the three classroom-based “C” courses relate to both clerkship and the rest of the curriculum. In a discussion about Service-Learning, led by Dr. Sanfilippo, faculty brainstormed ways additional service-learning opportunities could be created for medical students and others as well as ways they could support and encourage students in these endeavours. The Service Learning Advisory Panel will consider their suggestions and recommendations. Cherie Jones and Andrea Winthrop leading the workshop on narrative feedback. 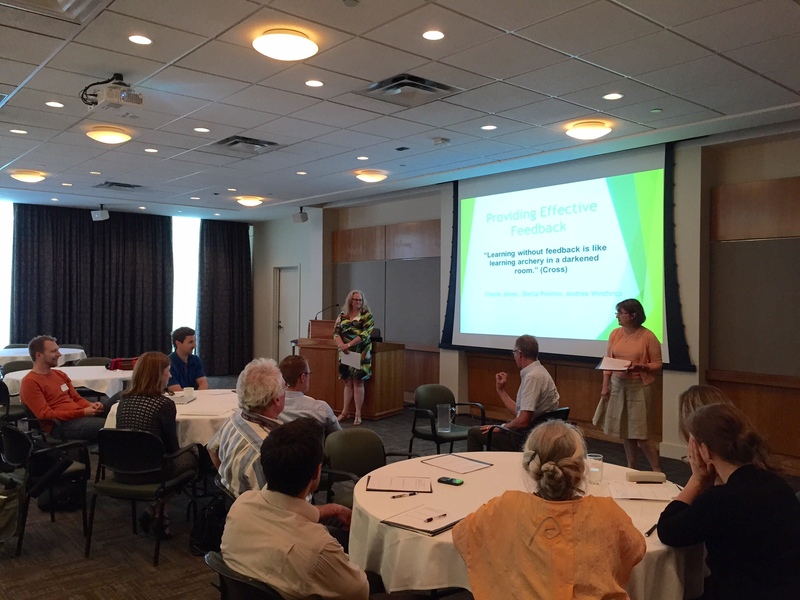 As a follow-up to last year’s popular workshop on remediation strategies, Michelle Gibson, Richard Van Wylick and Renee Fitzpatrick presented “Remediation 2” with additional cases and strategies. For the afternoon, participants chose between a session on writing narrative feedback or one on making ExamSoft work for you. Designed in particular for faculty working in clerkship, clinical skills and facilitated small group learning (FSGL), for the workshop on narrative feedback, Cherie Jones and Andrea Winthrop provided concrete examples and solutions to situations faculty routinely encounter when needing to provided constructive feedback to students. This included a discussion of ways in which oral and written feedback differ. To wrap up the day’s activities, pre-clerkship and clerkship course directors brainstormed with competency leads for ways the milestones identified for these intrinsic roles can be met throughout the curriculum. How to highlight and incorporate patient safety in different courses was also considered. Documents from the Retreat are available to curricular leaders under “Retreats” on the Faculty Resources Community Page. 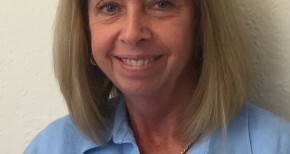 Dr. Anthony Sanfilippo, Associate Dean of Undergraduate Medicine has announced that Susan Haley has joined the staff of the UGME Student Affairs office as a career advisor. She will be working with Kelly Howse and Renee Fitzpatrick in UGME’s growing Career Advising group. 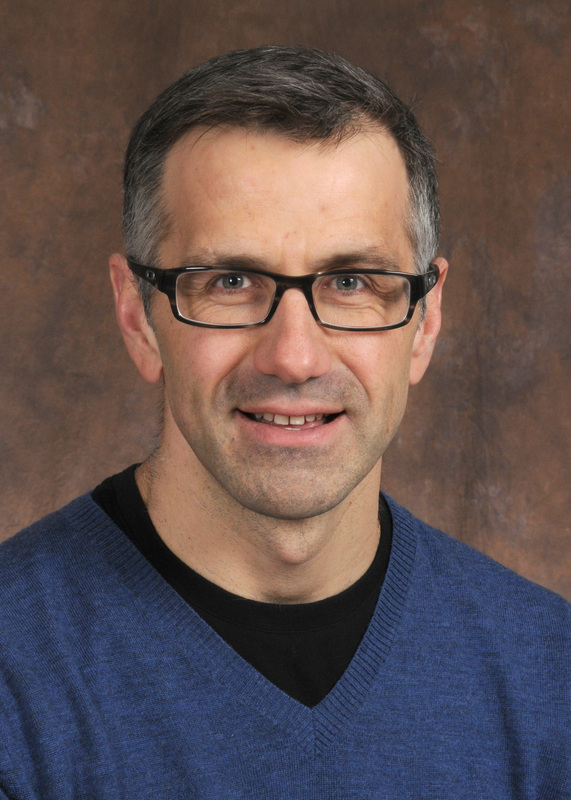 An anesthesiologist, Dr. Haley has practiced in Kingston for 16 years. Prior to moving to Kingston, she worked at Mount Sinai at the University of Toronto. While in Toronto, she also worked in the area of chronic pain treatment. Her current work interest is obstetrical anesthesiology. Since coming to Kingston, Dr. Haley has becoming involved in undergraduate medical education and has really enjoyed working with medical students, she said in an interview. 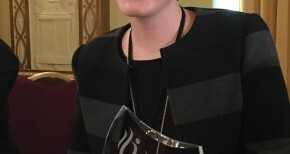 She noted that her own career has included a variety of experiences, including being a peer assessor at CPSO and sitting on a number of OMA committees. “I’d like to share the perspective of medicine that involves doing other things besides practicing medicine on a day-to-day basis,” she added. For appointments with Dr. Haley or any of the Student Affairs advisors, please contact learnerwellness@queensu.ca , stop by the Student Affairs office in the Undergraduate Medical Office or call the Learner Wellness Assistant at 613-533-6000 x78451. The Annual Faculty of Health Sciences Celebration of Teaching was held June 12 to celebrate innovative efforts of teaching, learning and scholarship in the faculty, sponsored by the Office of Health Sciences Education. This year’s theme was Connecting Curricular Innovations to Health Sciences Competencies. The conference featured an opening panel, a facilitated poster session, a dozen “swap shops” and a keynote speaker to wrap up the day-long event. The opening panel explored competency frameworks across health sciences disciplines. The panel featured Kathleen Norman (Physical Therapy); Catherine Donnelly (Occupational Therapy); Rosemary Brander (Interprofessional Education and Practice); Cheryl Pulling (Nursing) and moderator Damon Dagnone (Medicine). The facilitated poster session featured 25 posters in five categories. Posters presented research and other projects by faculty, students and staff members. For the half-hour swap-shops, presenters discussed a curricular innovation and led a discussion with participants about challenges and successes they had experienced. Topics ranged from how to give, receive and respond to feedback, to using YouTube in your teaching; from structured interprofessional observerships to engaging undergraduate students in research. Participants could attend up to three swap-shop sessions. The keynote presentation was delivered by J. Damon Dagnone, Faculty Lead for Competency Based Medical Education (CBME) for Postgraduate Medical Education. Dr. Dagnone is also an assistant professor in the Department of Emergency Medicine. How do we extract competency from our everyday healthcare environments? 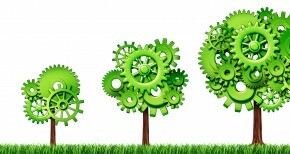 How are current practices of CBE implementation (un)realistic? How should assessment help drive the agenda? Dr. Dagnone’s presentation acknowledged both the challenges presented and the necessity for embracing competency-based frameworks and challenging time-based-only paradigms.